In the 1970s and 1980s many institutions, agencies and scholars believed that the Himalayan region was facing severe environmental disaster, due primarily to rapid growth in population that has caused extensive deforestation, which in turn has led to massive landsliding and soil erosion. This series of assumptions was first challenged in the book: The Himalayan Dilemma (1989: Ives and Messerli, Routledge). Nevertheless, the environmental crisis paradigm still commands considerable support, including logging bans in the mountain watersheds of China, India, and Thailand, and is constantly being promoted by the news media. 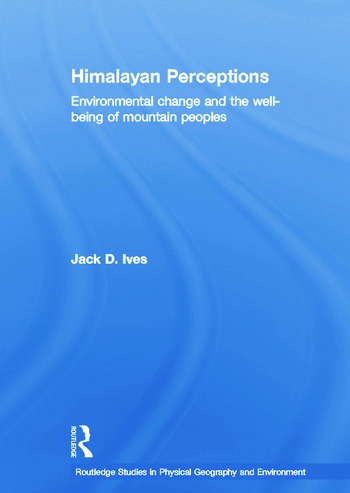 Himalayan Perceptions identifies the confusion of misunderstanding, vested interests, changing perceptions, and institutional unwillingness to base development policy on sound scientific knowledge. It analyzes the large amount of new research published since 1989 and totally refutes the entire construct. It examines recent social and economic developments in the region and identifies warfare, guerrilla activities, and widespread oppression of poor ethnic minorities as the primary cause for the instability that pervades the entire region. It is argued that the development controversy is further confounded by exaggerated reporting, even falsification, by news media, environmental publications, and agency reports alike. 1. The Myth of Himalayan Environmental Degradation 2. The Himalayan Region: An Overview 3. Status of the Mountain Forests 4. Geomorphology of Agricultural Landscapes 5. Flooding in Bangladesh: Causes and Perceptions of Causes 6. Mountain Hazards 7. Development of Tourism and its Impacts 8. Conflict, Tension, and the Oppression of Mountain Peoples 9. Prospects for Future Development: Assets and Obstacles 10. What are the facts? Misleading Perceptions, Misconceptions, and Distortions 11. Conclusions: Redefining the Dilemma; is there a way out? Jack D. Ives is Senior Advisor on Sustainable Mountain Development at The United Nations University, Tokyo.